John Barker started taking walking photographs on The Esplanade in Lowestoft around 1926, though the type of camera used is not known. However by about 1930 Barkers were using old 35mm cine cameras to take walkies. These cine cameras were of the so called English pattern, made mainly of mahogany with brass fittings. Up to 400 feet of film could be contained in wooden magazines inside the camera with the supply magazine on top of the take up magazine, making the camera body quite tall. This rare photographs shows George Meadows working for Barkers with a Williamson camera. He is just North of the Britannia Pier, Great Yarmouth, sometime between 1946 and 1954 (when the building seen on the pier was destroyed by fire). Courtesy Gail Godfrey. These cameras were used by early cinematographers but by 1925 were not up to the standards of the modern cinema as they could be properly synchronised for sound and came onto the second hand market. Many street photographers acquired these to take walking photographs. During the early 1930s full frame 35mm cameras were not really available or affordable in the UK. The cine cameras offered compact negatives on relatively low cost 35mm film and hundreds of photographs could be taken via a single loading. It is still open to debate how the strip walkies were taken. Either the handle was given a half turn to expose four frames, with only three being printed, or the single frame handle could have been turned three times in succession. Maybe it is time someone tried to replicate one of the old sequences to see which it was. 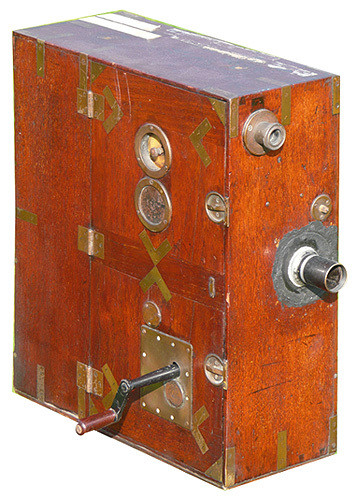 In the 1980s a wooden cine camera used by Barkers from about 1930 was given to the East Anglian Photographic Collection housed at the University of East Anglia. 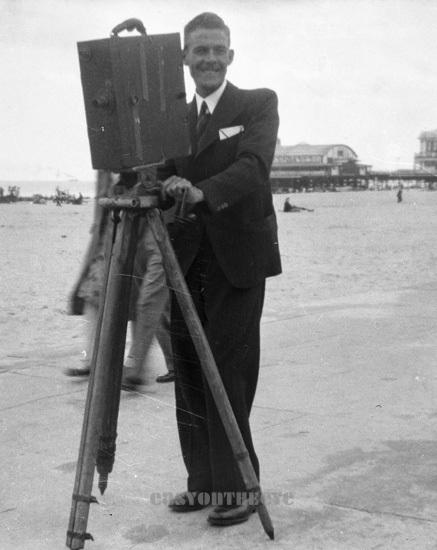 Curator Malcolm Howard identified the camera as being made by Alfred Darling of Brighton in 1905, a town at the centre of early British cinematography. Malcolm and the camera appeared in an Anglia Television programme called Bygones (21st January 1986). 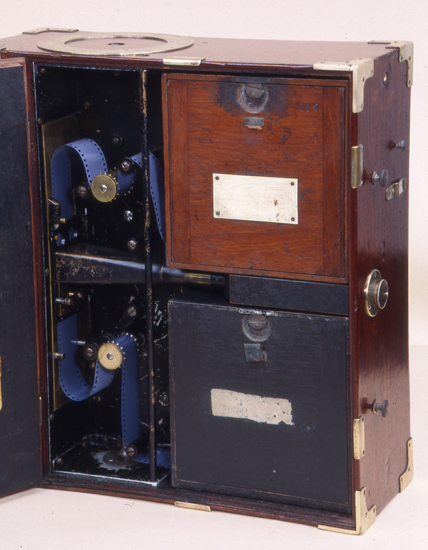 The photograph here shows the inside of this Alfred Darling camera used by Barkers (image courtesy Malcolm Howard). In 2010 another Barkers walkie camera was rediscovered. This camera was made by the Williamson Kinematograph Company Limited about 1912. James Williamson was another of the Brighton and Hove pioneers, a pharmacist with an interest in photography. The Williamson camera was one of their Tropical models, made with smaller pieces of mahogany joined with brass fittings, less prone to crack and split in extreme climates. The camera had been modified to only take single frames, probably just after WW2 (the motion picture and back-wind holes had been blanked out with two old half pennies dated 1940 and 1944!) to save on film. The camera was fitted with a Taylor Hobson Cooke anastigmat lens f3.5 73mm. 73mm is quite a long focal length being similar to 135mm on a full frame 35mm camera. The photograph here shows the Williamson camera used by Barkers. In the early 1950s Barkers acquired some pre-War German Leica cameras. Around six of these were the 250 model. This was a development of the Leica model 111(which Barkers also used) with the addition of large film chambers that held film in a length of 250 exposures. These cameras took what we now call a full frame negative (36mmx24mm) as opposed to the cine cameras that took a so called (24mmx18mm) half frame negative. Barkers retired the cine-cameras after the 1958 season. The Leica 250s were supplemented with 35mm Ilford Advocates and Agfa Silettes. Barry Drake with a Leica 250 in chrome finish. Barkers later sold the camera. Notice the GY Corporation licence badge. 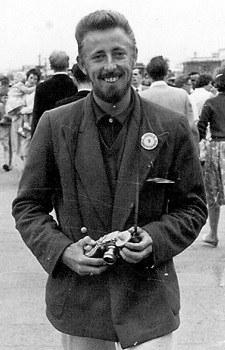 Barry was the resident photographer at Caister Holiday Camp for a time too. Photo from the collection of Barry Drake. These cameras took a standard 36 exposure film cassette. However Barkers (in common with most walkie firms) purchased film in bulk and reloaded old cassettes, albeit with a slightly shorter length of 30 exposures. By the late sixties the Leicas had all been sold and the walkie cameramen had moved over to cheaper Russian and Japanese rangefinder 35mm cameras for this work, the focusing system being well suited to moving subjects. Sadly the famous East Anglian Photographic Collection got dispersed when the University decided it no longer wanted to house it and we do not know where the former Barkers camera ended up. Happily the more recently discovered Barkers camera is owned by a collector who has generously allowed us access for this article.